Things it's Good To Know. Information about Hospitals, NHS 111, Doctors, Vets and HART Wildlife Rescue. A number of local organisations exist to provide different services and advice for older members of the community. 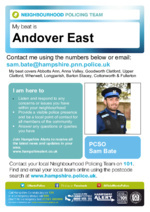 Read about the local Police and the Neighbourhood Watch.